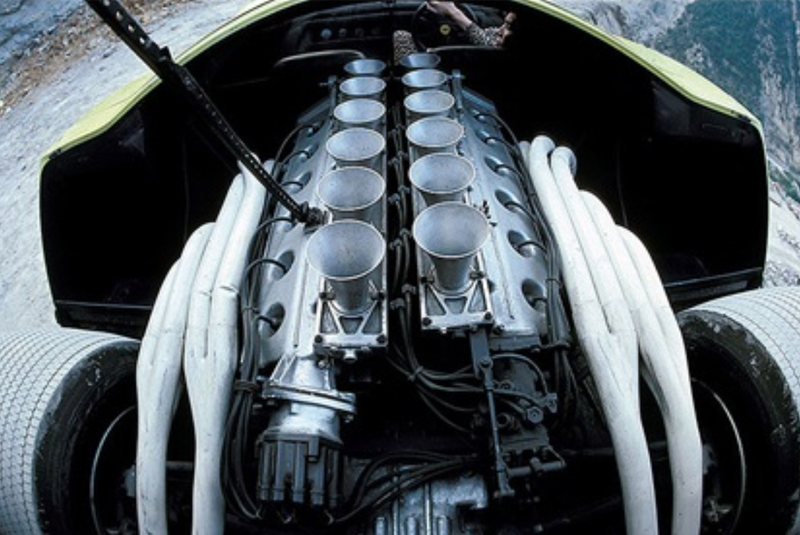 ‘A rather permissive rear end reveals part of the five speed transmission on the Pininfarina Ferrari 512S. There is the almost customary louvered backward look but its Wellsian. The chassis was a tubular structure with riveted light alloy panels contributing to the rigidity. The naughty nakedness around the car’s nether regions and the upswept slotted effect adjacent to the rear wheels assists with the expulsion of hot air that can be generated by such a projectile-from brakes, tyres, transmission exhaust system etc. Forward visibility from the two seats was remarkably good-useful with such performance’. So said Automobile Year 17’s summary of the rear of the Pininfarina designed Ferrari 512S Berlinetta Speciale in 1969. Amazing how appropriate a caption it is for this shot taken 45 years later! The original appeal in writing this article was the juxtaposition of ‘les derrieres incroyables!’ of car and model, but upon closer inspection the fusion of a racer, which had a ‘big hit’ at Monza in 1969 and then contributed its chassis as the basis for Pininfarina’s Ferrari ‘512S’ Speciale show car is an interesting one in itself. This article is a story about the two Ferrari ‘512S’ based Pininfarina designed Show Cars; the ‘Berlinetta Speciale’ of 1969, actually based on the chassis of a 312P, and ‘Modulo’ of 1970, actually based on a 512S chassis which raced as a 612P. Simple really! 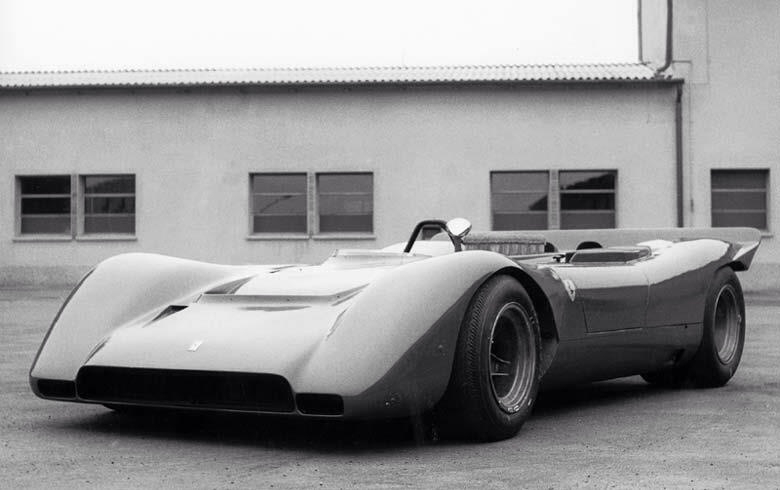 The chassis of the ‘512S Speciale’ was the first of the 1969 312P endurance racers completed. It was the car launched to the press at the Hotel Fini, Modena on December 14 1968. 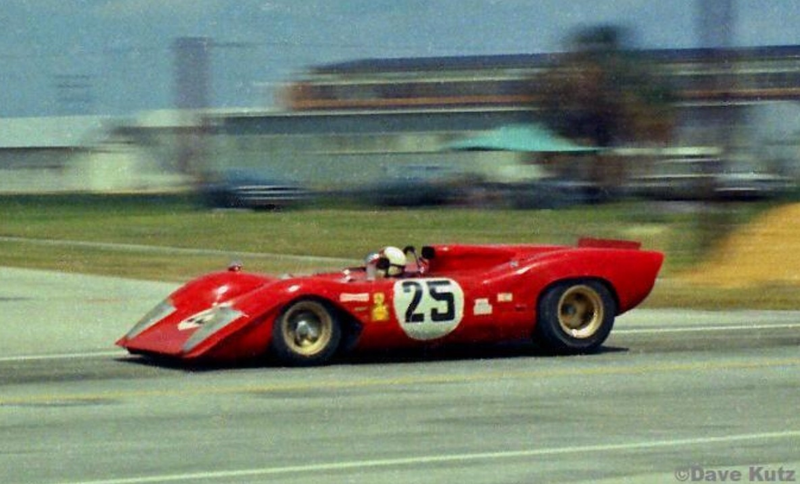 In early 1969 it was damaged testing at Vallelunga and therefore didn’t make the season opening championship round at Daytona, but was rebuilt in tine for the Sebring 12 Hour in March. 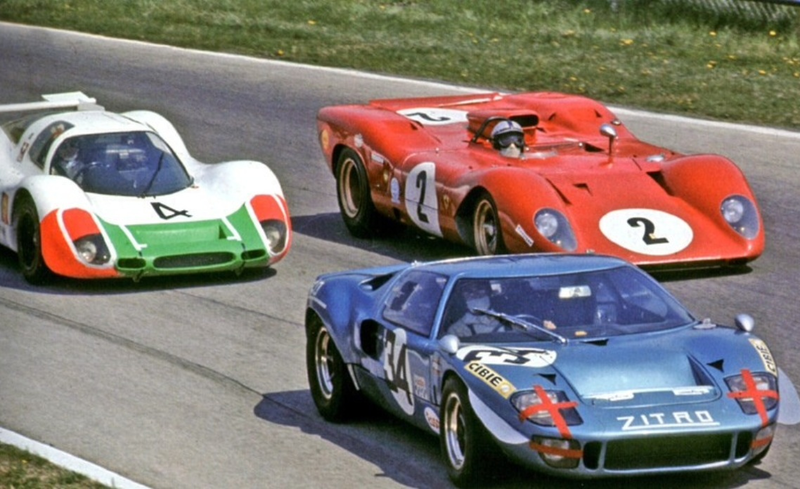 Chris Amon and Mario Andretti drove the car, the curvaceous 3 litre V12 winning its class and finishing 2nd overall to the venerable 5 litre Ford GT40 of the ‘Jacks’ Ickx and Oliver. 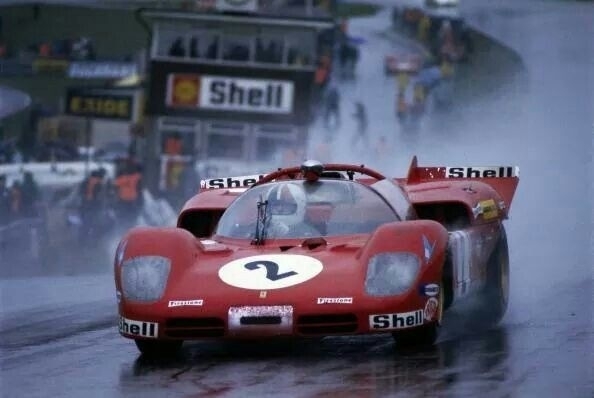 Amon was paired with Pedro Rodriguez at Brands Hatch, the pair finished 4th in the 500Km race won by Jo Siffert and Brian Redman in a Porsche 908/2. Note that some sources say the Chris/Pedro car was ‘0870’ not ‘0868’ which they say did not arrive. Whatever. 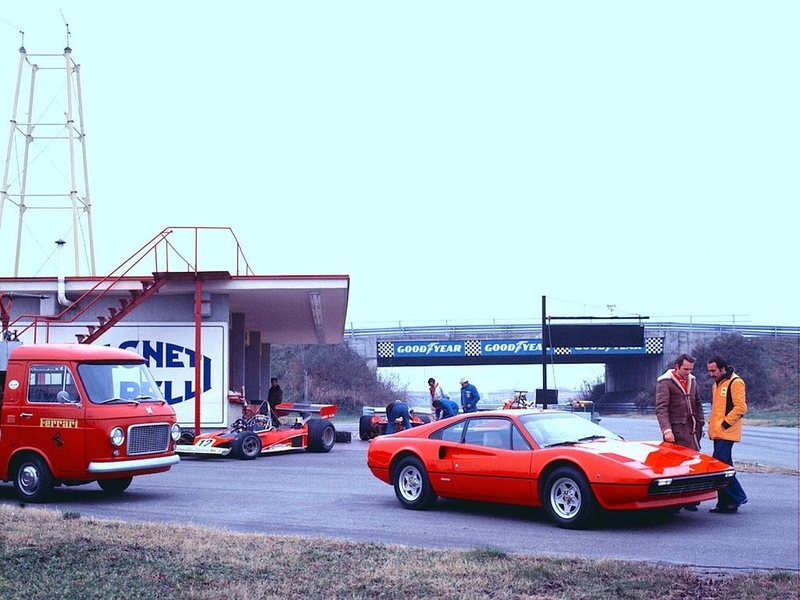 A fortnight later, on 25 April the car was entered at Monza for the 1000Km home event, Pedro back behind the wheel this time paired with Peter Schetty, later a successful Ferrari Team Manager. During the race a left rear Firestone blew, damaging the rear bodywork, Pedro nursed the car back to the pits on lap 66. 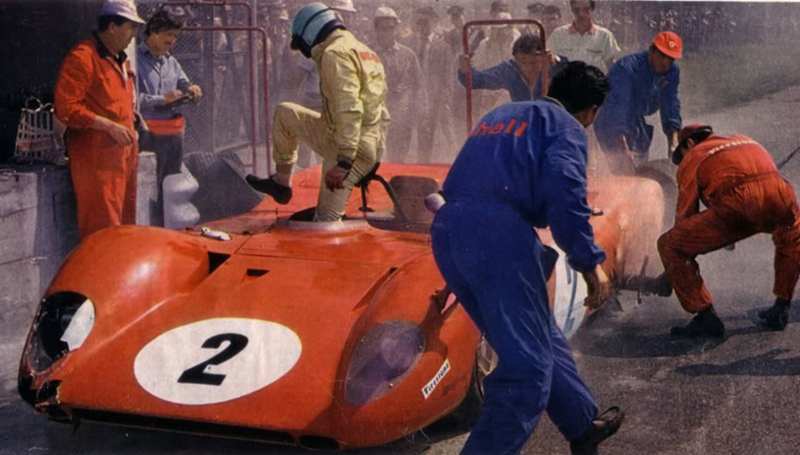 The crew quickly got him going but had not properly affixed the rear bodywork which blew off the car at high speed causing a huge accident of the type which took Bruce McLaren’s life 12 months later at Goodwood, fortunately without injury to Pedro but comprehensively ‘rooting’ the car. It was taken back to the factory and put to one side whilst the other two 312P chassis were used for the racing at hand. So, why call the Berlinetta Speciale a 512S if twasn’t? 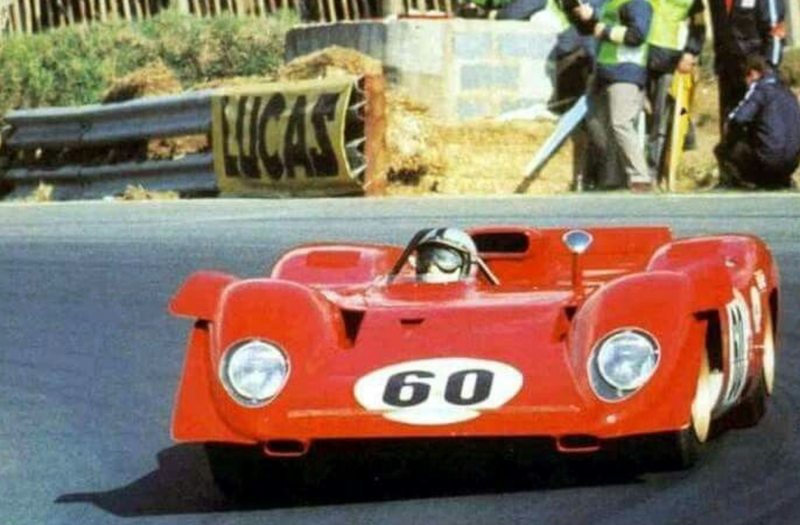 Whilst Enzo’s coffers were full of Fiat lire given the Italian corporates 1969 Ferrari investment, the Scuderia had the not insignificant problem of flogging the 25 512S’ required to be built for homologation into the FIA’s Group 5 to race in 1970. And no amount of Ferrari homologation ‘jiggery-pokery’ with promises of cars to be built would satisfy the CSI given the hoops Porsche had to jump to achieve certification of production numbers of their 4.5 litre 917 ‘Panzer-Wagen’ which created the need for all those 512S to be built in the first place… Given the working capital involved in designing, building and carrying the holding costs of unsold cars on his Balance Sheet be in no doubt about just what a priority Le Mans was to Ferrari for all those years. Filippo Sapino longest creative stint was 30 years as design director at Ghia but his most stunning project was the ‘Ferrari 512S Berlinetta Speciale’, completed whilst at Pininfarina for a short while in the late 1960s. Launched at the 1969 Turin Motor Show, the car caused enormous interest as it was the first Ferrari with ‘wedge styling’, a design trend of the late sixties. Regardless, ‘Sapino had made the most of the floor-hugging physique of the chassis, adding some unorthodox surface treatments to visually transform static into supersonic. Flourishes such as the flip-up canopy completed the Speciale’s theatre’. 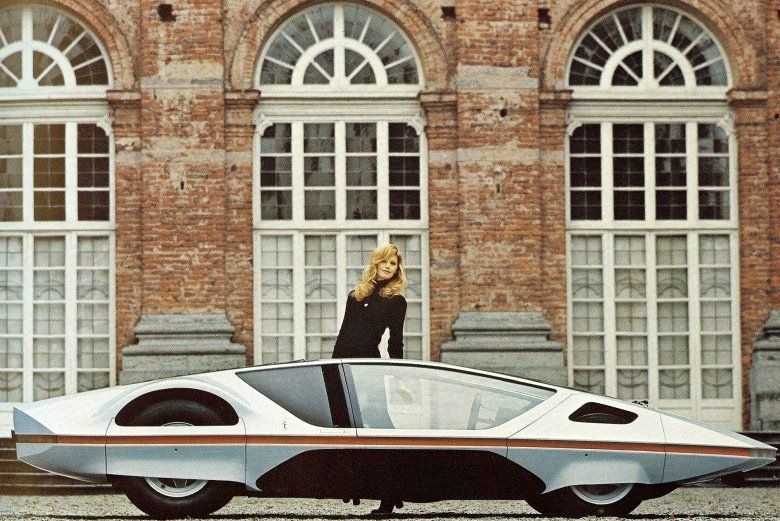 The truly stunning Pininfarina Ferrari Modulo. As stunning now as when first launched at Geneva in 1970. This shot was in Automobile Year 18. In fact the choice of Sapino’s design as Pininfarinas 1969 Show Star rather than Paolo Martin’s is an interesting bit of Pininfarina politics, which worked out rather well for PF, Ferrari and i suspect both designers. In 1968 at Pininfarina he was wrestling with the design of a dashboard of the Rolls Royce Camargue when he conceived the design of a car which became known as the Modulo, which he described as ‘The craziest dreamcar in the world, the most unique, violent, inimitable and conceptually different’. 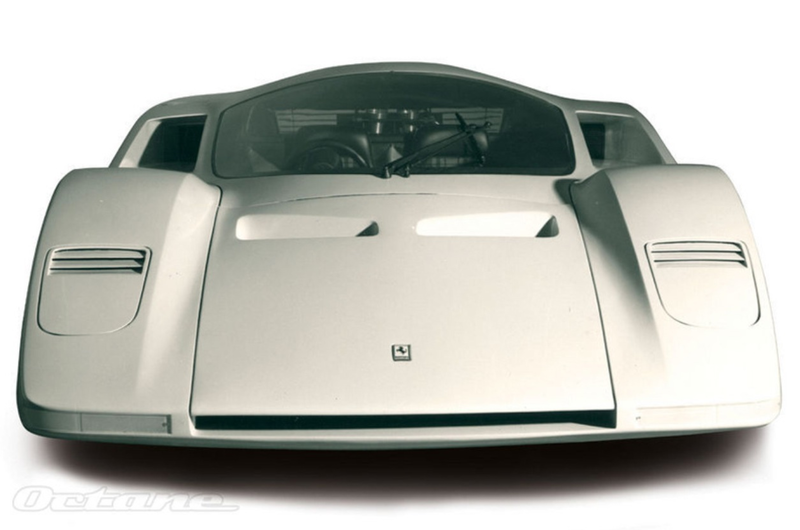 Sketches were drawn, Martin had an ally in PF Director Franco Martinengo but Sergio Farina was not convinced even by Martin’s full scale polystyrene model of the car which he completed by August 1968. ‘Why would you draw a car like this?’ he asked Martin. “Its important that they will speak of it’ he replied. Farina’s rejoinder ‘Yes, but they will speak ill of it’. And so, as its showcar in 1969 Pininfarina went with Sapino’s more conservative, i hesitate to use the word, the car is stunning but in relative terms the car is conservative beside the Modulo, as was everything else was when the car appeared at Geneva in 1970. 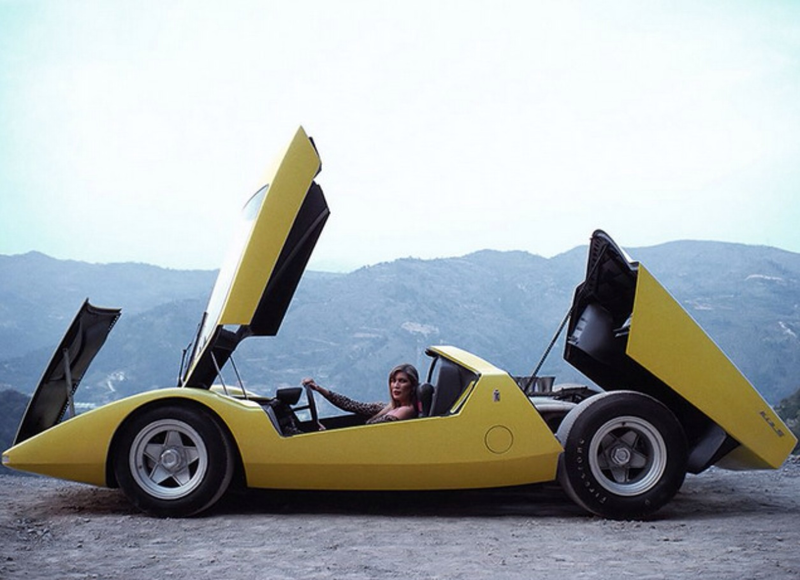 Emboldened by the success of the Berlinetta Speciale in 1969 Pininfarina was ready to endorse Martin’s Modulo which made its show debut in 1970, it truly was and is a remarkable milestone in automotive design, still fascinating audiences when it makes occasional show appearances now. The Modulo is an interesting story for another time, it was based on a 512S chassis but the account is far from clear. The consensus seems to be that 512S chassis ‘1027’ was built up as Ferrari 612P ‘0864’, the car one of 2 (‘0866’ the other) raced by Chris Amon in the 1969 Can Am series. 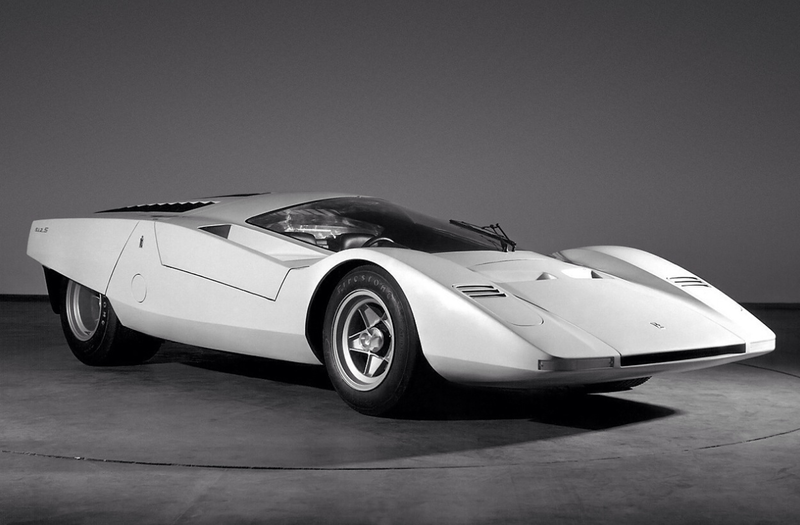 At the end of the cars unsuccessful campaign, the McLarens M8B Chevs dominant that year, its remains including the original chassis less chassis plate was given to Pininfarina to be used as a base of the Modulo. 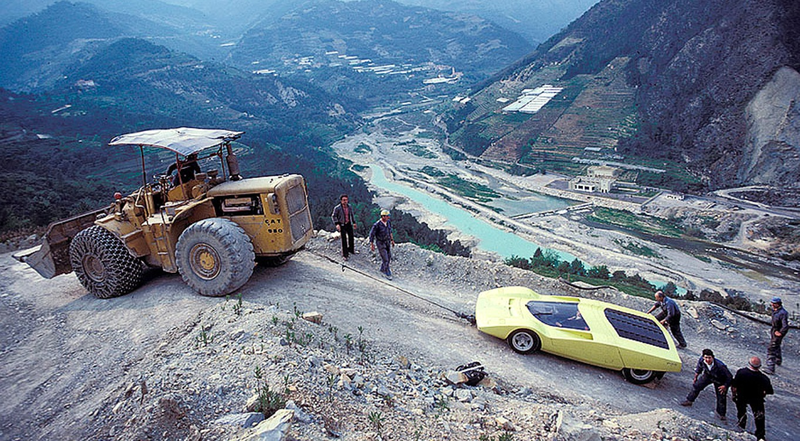 The photo shoot atop a mountain top at Como, Italy which inspired this article was shot by noted racing photographer Rainer Schlegelmilch, Who knows what its all about, and who cares…both car and babe shown to great effect!